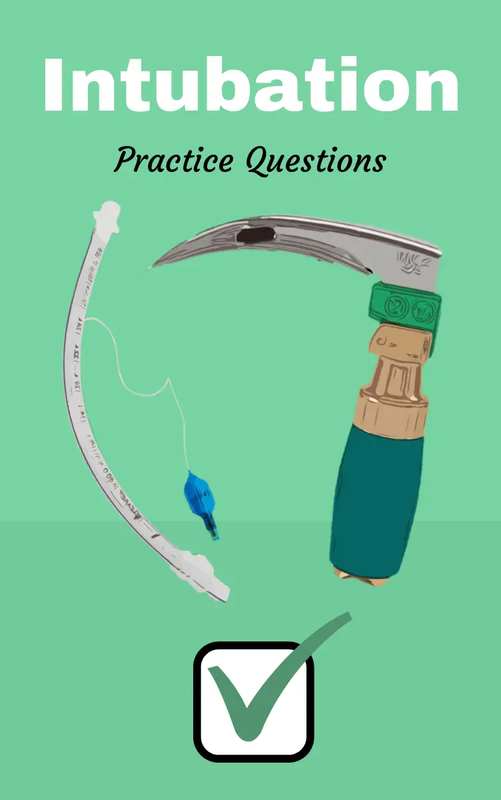 Are you looking for Intubation practice questions that can help you learn the ins and out of the procedure? If so, good, because this study guide is loaded with them and can help you learn just that. Intubation is the process of inserting a tube into the trachea to maintain an open airway for a means of providing mechanical ventilation to the patient. As a Respiratory Therapist, this is a procedure that you will perform (or assist with) very often. That is why it’s extremely crucial that you develop a full understanding of the intubation procedure as a student. Not to mention, you will need to know this information for the TMC Exam as well. So if you’re ready, let’s go ahead and dive right in. 1. What is endotracheal intubation? It is the passing of an endotracheal tube through the mouth or nose into the trachea in order to establish and protect the airway as a means to provide mechanical ventilation to the patient. 2. What should you do immediately after intubation? Verify that the tube is in the trachea by: checking for symmetry of chest expansion, auscultate for bilateral breath sounds, and order a chest X-Ray to confirm proper placement. 3. How much pressure should be in the cuff? 4. What can occur if the cuff’s pressure is too high? Bleeding, ischemia, or pressure necrosis may occur. 5. What can occur if the cuff’s pressure is too low? 6. How long can a patient be intubated? 7. What are some disadvantages for a endotracheal intubation? Discomfort, decreased cough reflex, thickened secretions, depressed swallowing reflex, increased risk of aspiration, and ulceration of the larynx or trachea. 8. What can happen due to inadvertent removal of the endotracheal tube? Laryngeal swelling, hypoxemia, bradycardia, hypotension, and death. 9. How can you prevent the inadvertent removal of the endotracheal tube? Educate the patient and family for the purpose of the tube and restrain the patient. 10. What are some manual airway maneuvers? Head tilt, chin life, and jaw thrust. 11. What are the indications for the head tilt, chin lift maneuver? No cervical injury, the patients must have the ability to protect their own airway to prevent aspiration. 12. What are the contraindications for the head tilt, chin lift maneuver? Patients that are conscious, and those with spinal injuries. 13. Describe how to perform the head tilt, chin lift maneuver? The patient is in the supine position, place one hand on the patient’s forehead and apply downward pressure with the palm, place the tips of your fingers on the other head under the chin and gently lift while using the same hand to open the mouth by pulling the lip down with the thumb. 14. What are the indications for the modified jaw thrust maneuver? An unresponsive patient with a possible c-spine injury. 15. What are the contraindications for the modified jaw thrust maneuver? 16. What are the indications for a nasopharyngeal airway? When an oral airway is contraindicated or impossible, biting, maxillofacial trauma, responsive patient, and frequent suctioning. 17. What is a contraindication for a nasopharyngeal airway? Patient intolerance; also basilar skull fracture. 18. What are the indications for an oropharyngeal airway? To maintain an open airway of unresponsive patients, to aid in ventilation with a bag-mask, to be used as a bite block after ET tube insertion. 19. What are 4 essential components of a bag-valve mask? Self-refilling bag, mask, oxygen reservoir, and a supplemental oxygen source. 20. What are 3 advantages of bag-valve-mask ventilation? It can convey a sense of compliance, immediate ventilatory support, and is suitable for spontaneous or apneic patients. 21. What are 2 disadvantages of bag-valve-mask ventilation? It is difficult to maintain a leak-proof seal and also, gastric distention. 22. What technique can you use to clamp the esophagus while bagging so air doesn’t go into the stomach? 23. What are 5 things to do if chest does not rise while using a bag-valve mask for ventilation? Reposition the airway, check for airway obstruction, lift the jaw, suction, and intubate if necessary. 24. What could make it hard to achieve an adequate seal with bag-valve-mask ventilation? The patient is obese, facial hair, no teeth, patient with poor compliance (CHF, bronchospasm, pneumothorax). 25. What are some reasons for intubation? Respiratory depression due to drugs, support for gas exchange, increase lung volume, maintain an obstructed airway, foreign body, bleeding, edema, trauma, altered level of consciousness, potential aspiration, and elective (i.e. for surgery). 26. Name the pieces of equipment needed for intubation? Oral airway, bag-valve mask, flow meter, suction equipment, laryngoscope handle and blades, ET tubes, 10 cc syringe, stylet, tube tape, stethoscope, ETCO2 or colorimetric detector. 27. What are the laryngoscope blade sizes for infants? 28. What are the laryngoscope blade sizes for adults? 29. The laryngoscope blade should reach between what 2 things? The patient’s lips and larynx. 30. Which type of laryngoscope blade directly lifts the epiglottis upward? 31. Which type of laryngoscope blade indirectly lifts the epiglottis? 32. What are the ET tube sizes for males? 33. What are the ET sizes for females? 34. What are some ways to confirm ET tube placement? Visualize as it passes through vocal cords, auscultate the stomach then lungs, look for condensation in the tube, look for bilateral chest rise, CO2 colorimetric detector turns yellow (remember: yellow is mellow, gold is good :)), and finally, confirm with a chest x-ray. 35. What are some common errors in intubation technique? Positioning errors, poor head placement, change bed height, don’t hunch over enough, don’t push on teeth, placing the tube too deep. 36. What are the estimated depths for ET tube placement for males and female? 22 cm for males, and 21 cm for females. 37. What are the indications for nasal intubation? This procedure is more comfortable for awake patients, long-term intubation, less tube movement, surgical access to mouth needed, c-spine injury, facial fracture, and to avoid the risk of hypotension. 38. What are 4 contraindications for nasal intubation? Nasal fracture, basilar skull fracture, nose bleeds, and sinusitis. 39. What are 5 complications of nasal intubation? Nosebleeds, submucosal dissection, inflammation, edema, and the stimulation of gag reflexes. 40. The patient’s vocal cords are most open during when? Inspiration; so that is when you should advance the ET tube for nasal intubation. 41. When placing a nasal airway, make sure to monitor what 6 things? 42. What are the 4 ways to provide supplemental oxygen to the patient while performing a nasotracheal intubation? Nasal cannula placed in the other nare, face mask over mouth, oxygen tubing near the patient’s mouth, and a nasal airway in other nare hooked to oxygen. 43. What are some things to try if the passage of the nasotracheal tube into the trachea is difficult? Turn the patient’s head to the side, change the degree of flexion or extension, apply cricoid pressure, push larynx toward opposite side of nares, have the patient stick out there tongue, use a laryngoscope, use Magill forceps, and use a fiberoptic bronchoscope. 44. What are the 3 ways to achieve patient comfort during intubation? Relief of anxiety, pain, and promote rest/sleep. 45. When should you avoid sedation? In shock, airway obstruction, or respiratory failure. 46. If the patient doesn’t receive enough sedation, this can cause what 3 things? Poor cooperation resulting in trauma and aspiration, difficulty performing intubation, and hypertension. 47. If the patient gets too much sedation, it is life-threatening and can cause what 4 things? Hypoventilation, apnea, cardiac arrest, and a decrease or loss of protective airway reflexes. 48. What are the two types of drugs used in sedation and what do they do? Narcotic analgesics are used to relieve pain and Sedative Hypnotics are used to decrease anxiety and induce sleep. 49. What are the three benefits of Narcotic analgesics? Potent analgesics, moderate sedative properties, and no anxiolytic or amnesic properties. 50. What are the five adverse effects of Narcotic Analgesics? Nausea, vomiting, constipation, confusion, and respiratory depression. 51. What are three examples of narcotic analgesics? Morphine, Fentanyl, and Demerol (Penthidine). 52. What is the onset and duration of Morphine? 53. What is the onset and duration of Fentanyl? The onset is 30 seconds, duration 30-60 minutes. 54. What is the reversal agent for Fentanyl called? 55. What are sedative hypnotics and what do they do? They are sedatives with anxiolytic, anticonvulsant, and amnesic properties to decrease anxiety and promote sleep (Example: Benzodiazepines). 56. What is the most common sedative hypnotic? 57. What is the onset and duration of Versed? Onset 1-3 mins, duration 20-45 mins. 58. What is the reversal agent for Versed? 59. What is the onset and duration of the sedative hypnotic Valium (Diazepam)? Onset: 1-3 mins, Duration: 30 minutes-2 hours. 60. What is the onset and duration of the sedative hypnotic Ativan? 61. What drug is a sedative and moderate anxiolytic with rapid onset and lipid emulsion? 62. What is the duration of action of Propofol? 63. What produces a temporary loss of sensation or feeling in a confined area of the body? 64. What do inhaled anesthetic agents do? Aerosolized medication into the oropharynx and lungs to inhibit sensory nerves that carry painful stimuli to the CNS. 65. What are four benefits of Rapid induction? Easier to perform intubation, relief of side effects associated with awake intubations, minimal change in vital signs, and avoid trauma associated with struggle. 66. What are the side effects associated with awake intubations? Hypertension, tachycardia, increased ICP in head injury, airway stimulation worsening bronchospasm. 67. What are three adverse effects of Rapid Induction? Myocardial depression, Hypotension, and the worsening of airway obstruction due to loss of laryngeal muscle tone. 68. The preparation of the patient for Rapid Induction includes monitoring what? Heart rate and rhythm, respiratory rate and depth, SpO2 and skin color, blood pressure, level of consciousness and airway. 69. How soon should the patient awaken after Rapid Induction? 70. How do you prepare the airway for Rapid induction? 71. What four things must you keep immediately available during rapid induction? Suction and yankauer, bag-mask, and a crash cart. 72. What is the criteria for extubation? Adequate respiratory mechanics, stable VS, Normal electrolytes, Hgb, Hct, adequate UO, no acute processes, adequate LOC, CXR stable, recovery from airway reflexes, recovery from anesthesia. 73. Why is Stridor most likely heard when a patient self-extubates? Because of the cuff being pulled out while inflated. 74. What is the treatment for mild stridor? Cool mist, racemic epinephrine, and steroids. 75. What is the treatment for moderate to severe stridor? The process of the insertion of an endotracheal tube through the mouth (or nose), through larynx, and into the trachea to provide an airway for mechanical ventilation. 77. What are the 2 ways of Intubation? Orotracheal intubation (oral), which is most common, and Nasotracheal intubation (nose). 78. What are the Indications for Intubation? Respiratory failure, anaphylactic, seizure, respiratory insufficiency (or impending failure), somebody not breathing (code blue), heavily sedated, blood gas results showing respiratory acidosis, the need for airway protection. 79. What are the complications of intubation? Trauma, bleeding if you’re too aggressive, breaking teeth. 80. What are the contraindications to Intubation? The patient’s living will indicating the desire not to be intubated. 81. What are the components of an Endotracheal (ET) Tube? 15 mm adapter, Pilot Balloon, Cuff, Beveled tip, Curved Body with cm markings, Radiopaque Line, Murphy Eye, and the vocal cord line. 82. What is the 15 mm adapter? It hooks to common equipment such as the AMBU bag and/or Ventilator. 83. What is the Pilot Balloon? It is for air insertion/deflation and cuff pressure monitoring. 84. What is the Cuff? It seals off the lower airway for ventilation and prevents aspiration. 85. What is the purpose of a beveled tip? 86. What is the purpose of the curved body with cm markings? It indicates the distance from the end of the tube and is used as a landmark for securing. 87. What is the radiopaque line? A line that is visible on an x-ray to determine tube tip position. 88. What is the Murphy Eye? It is a safe-guard to ensure the airway, if the tube becomes obstructed. It is an extra hole on the tip of the tube. 89. What is the vocal cord line? It is used to indicate when to stop ET tube insertion. 90. What size ET tube should be used for males? 91. What size ET tube should be used for females? 92. What size ET tube should be used for neonates? The size is based on their weight. 93. What is the typical tube position for males? It should be placed 21-23 cm at the lip. 94. What is the typical tube position for females? It should be placed 19-21 cm at the lip. 95. What are the two types of Laryngoscopes? 96. What type is the Miller blade? It is a straight blade and directly lifts the epiglottis. 97. What size Miller blades should you use for an adult? 98. Where do you aim with the Miller blade? Aim over the epiglottis to directly move it out of the way. 99. What type is the Macintosh blade? It is the curved blade and it indirectly lifts epiglottis by lifting the valeculla. 100. What size Mac blades should you use for an adult? 101. Where do you aim with the Mac blade? 102. What are the 2 types of laryngoscopes? Regular – lighted by a small light bulb. Fiberoptic – lighted with a fiberoptic channel. 103. What is the process for using a Laryngoscope and intubation? Open the airway by placing the head in a “sniffing’ position. Hold the handle in left hand and insert into the right side of the mouth, moving it toward the center, and moving the tongue out of the way to the left. Displace epiglottis based on blade style and lift up and forward. Do not use the teeth as leverage to help lift. Look for the vocal cords and when you can visualize vocal cords, insert the ET tube watching it go through the cords. Stop advancing tube when the cuff has passed the cords by 2 cm or when vocal cords are even with vocal cord line. Stabilize the tube with the right hand and remove laryngoscope. 104. What are the methods for confirming the placement of an ET tube? Colorimetry device/capnography, esophageal detection device, Chest X-ray, Direct laryngoscopy, Videoscope/Glidescope, Bronchoscope, Light wand (lighted stylet), Presence of vapor trail, Chest rise, Bilateral breath sounds. 105. What is the next step after the ET tube is in place? After the tube goes in and the laryngoscope out, remove the stylet, inflate the cuff, and confirm the tube position (cm marking). 106. How long should an intubation attempt last? Intubation attempts should not exceed 30 seconds. Watch the oxygen saturation and manually resuscitate as needed. 107. What color is good for the colorimetry device? You want it to turn from purple to yellow. Remember: Yellow is Mellow. Gold is Good. 108. What is the best way to confirm tube placement? 109. Where should the tube be placed? 2-6 cm above the carina, Thoracic (T)2-5, Below clavicles, Approximate level of the aortic arch. 110. What are the causes of a difficult airway? Obesity, mandible malformation, blood/ secretions/ gastric content. 111. What is a common specialized insertion technique? Apply cricoid pressure to the throat. 112. What is the purpose of the Cuff? To seal the airways. The goal is to keep cuff pressure below the mucosal capillary. 113. What is the normal cuff pressure in cmH20? 114. What is the minimal leak test? When the tube goes in, inflate the balloon then deflate it until you hear a little bit of gargle. Make sure that it is a very slight gargle because you don’t want to damage the airway. 115. What is the purpose of the radiopaque line on the ET tube? Because you can see the line on the chest x-ray to confirm proper position. 116. What is the purpose of the cm marking on the ET tube? It is a measurement to see how far the tube is in. 117. What is the purpose of Murphy’s eye? It is an extra hole on the side of the tube, for just in case you were pushing down and you run into a lot of secretions, the extra hole is there to help the patient breathe through it. 118. What is the purpose of the stylet? It helps keep the tube’s rigidity and holds in place so it will go in the trachea. 119. Why do we use Lidocaine? Lidocaine is a numbing agent, so it helps numb the vocal cords to decrease the chances of laryngospasm. 120. What equipment do we need to extubate? Yankauer, pulse oximeter, towels, oxygen device (for the patient). 121. What is the purpose of the deep breath and cough during extubation? It helps to open the airway all the way so that the tube won’t cause damage to the vocal cords. 122. What is a common complication of extubation? So there you have it. That wraps up our study guide full of intubation practice questions. I hope this information was helpful and you can use it along your journey of becoming a Respiratory Therapist. I’m confident that you can go through these practice questions to learn and fully understand this information. By doing so, it will not only help you now but for years to come as you enter your career as a Respiratory Therapist. Thank you so much for reading and as always, breathe easy.